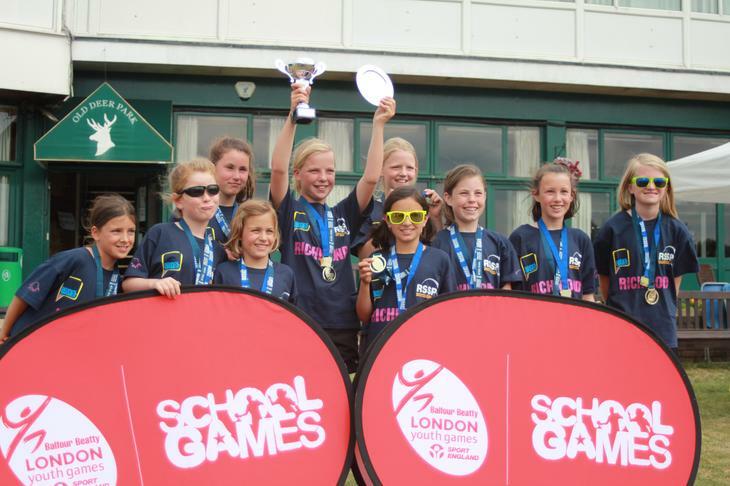 Girls' Kwik Cricket London Finals Champions! On Thursday 25th June, Collis Girls’ Cricket Team participated in the London Youth School Games. Ten girls from Yrs 5 and 6 went to Old Deer Park in Richmond. Abi, Emma B, Matilda, Louisa, Lydia, Tara, Kate, Emma N., Catia and Imogen were the team that went to play against 33 boroughs. When we got there, Dave Waldron and Mr Loizos went in to the ‘briefing’. When they came out, we found out our first opposition - Kingston. Then Dave told us our first squad and we were off! We batted first and did really well and won. Our second game was amazing; we won again. Fortunately, we also won our third match - we were through to the knock-out stages. We got to the quarter finals and were overwhelmed that we won. We were now through to the semi-finals. Again, we won, and were through to the final. We strode over to pitch 3 where we shook hands with our opposition, Harringey, and began the crucial match. WE WON and got 277 runs! We were delighted. Unfortunately, Nationals was cancelled and now we are going to Lords Cricket Ground on the first day of the Ashes. We will play in front of 30,000 people. We are truly chuffed! !